Mike Morris, 32, poses for a portrait outside after he attended an expungement clinic Saturday, February 23, 2019. The second popup newsroom was held during an expungement clinic inside Classics Hub Barbershop on the 2100 block of Broad St. in South Philadelphia. The Classics Hub Barbershop in South Philly is a whirlwind of activity on Saturday mornings. Nearly every chair is occupied, with friendly, and fashionable, stylists talking up clients — or talking them down, as was the case this weekend of a little boy whose cries seemed to signal the rite of passage of a first haircut. Some hugged the walls, waiting their turn. But on this day, others bypassed the commotion and chatter, and headed up a steep stairway to a space that owner Ulysses Kae Williams reserves for community events and outreach. Fewer places are as attuned to community needs than a barbershop — and on the morning I visited, what the men I spoke with said they needed even more than a clean-up was a clean record. Columnist Helen Ubiñas's second popup newsroom was held on the second floor of Classics Hub Barbershop during an expungement clinic Saturday, February 23, 2019. Robert Mayes was one of them. The 29-year-old Philadelphian was early for the record-expungement clinic held at Classics Hub. He waited patiently as organizers and volunteers from the Defender Association of Philadelphia and South Philly’s Participatory Defense Hub (more on them later) set up their tables. I was setting up my own, the barbershop being the second of my pop-up newsrooms, a fancy way of describing a borrowed company banner, some @NotesFromHel branded chocolates and pens — of which 2-year-old Hayaa enthusiastically approved — and yours truly, asking people to share their stories where they live. Some scenes from the second @notesfromhel Pop-up Newsroom today at a record expungement clinic @classicshub. Big thanks to @antonmoore14 @phillydefenders, South Philly's Participatory Defense Hub, and of course, all the people who were kind and open enough to talk to me about why they were there - employment, better employment... (And big thanks to @margoreedphoto for her photos - hers are the good ones!) Oh, the cutie is 2-year-old Hayaa who approved of my pop-up newsroom swag - especially the chocolates. The first pop-up was in December at Southwark School, at an event hosted by Sunrise of Philadelphia and the Fleischer Art Memorial that encouraged kids, most of them from immigrant families, to tell their stories. This is all still a one-woman experiment, but to borrow a line Knight Foundation president Alberto Ibarguen used to open up a news conference on Tuesday, it’s a way to shorten the distance between our neighbors and the news. Or, more specifically, neighbors whose stories we too often ignore and the news that actually matters to them. “Jobs.” he said, and the obstacles – educational, economical and judicial – that sometimes make getting them challenging. An estimated one in three Philadelphians has some kind of criminal record. These clinics are a way to help, as are the participatory defense hubs, a relatively new community organizing model where people meet weekly to support each other and share firsthand knowledge about the legal system to better present and defend themselves. Columnist Helen Ubiñas speaks with Anton Moore, who organized an expungement clinic, where she met people who wanted to share stories Saturday, February 23, 2019. 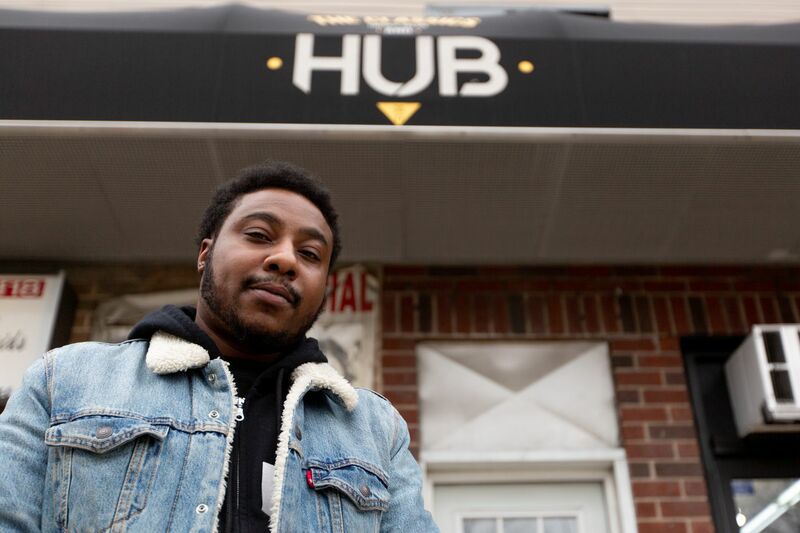 The second popup newsroom was held during an expungement clinic inside Classics Hub Barbershop on the 2100 block of Broad St. in South Philadelphia. One of the great things about these pop-ups is the serendipitous discoveries. At the first one, it was local photographer Ada Trillo, whose stunning photos of the migrant caravan in Mexico I ended up writing about. This time it was the people who volunteer their time at the participatory hubs I hope to check out soon. But on Saturday, my attention was on those who found their way to the clinic. Mayes told me he has convictions for receiving stolen property, and has mostly made his own opportunities with real estate and repping a local rapper. He was hoping to find something more stable, but his record kept him from even a job making doorknobs. A text in response to his inquiry about the warehouse job confirmed that. Expungement is a process — a petition, a hearing in front of a judge, the right documents that need to be sent to the right state agencies. There were no easy answers or fixes on Saturday, especially for those convicted of felonies, but no one was sent away without information to at least get the process rollling. David Thompson was one of the men. He was working, and slowly but surely getting his life together after a crime he wasn’t keen on revisiting. But he hoped with the advice he got at the clinic, he’d be on his way to cleaning up his record so he could get a better job, a goal many people echoed.